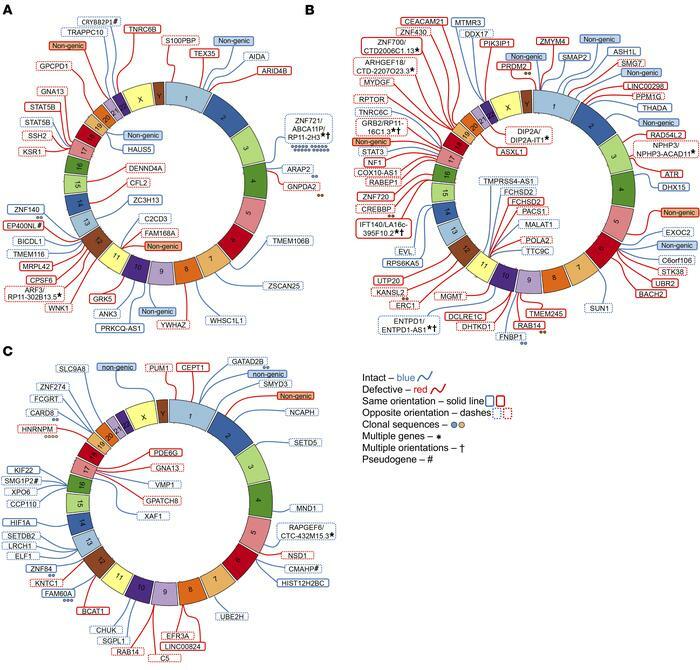 Chromosomal positions of intact and defective HIV-1 proviruses. Circos plots demonstrating chromosomal integration site positioning of intact and defective proviruses from 3 study participants (A, patient 1; B, patient 2; C, patient 3). Color and line coding indicate viral sequence characteristics (intact vs. defective) and orientation of integrated provirus relative to host gene. Targeted genes were identified using Ensembl (v86); gene names are shown according to HUGO classification (https://www.genenames.org). Colored dots indicate the number of clones detected. *Sequences in chromosomal regions associated with multiple genes; †mixed orientation among these genes; #integration sites in pseudogenes.